Reduce the lamp to plant distance without burning the tender growing tips of the plants. Increase th.. Variable 0-60sec delay motor. Reduce the lamp to plant distance without burning the tender growing t.. Variable 0-60sec delay motor. .. Variable 0-60sec delay motor. Suitable for up to 6 lights on 2 crossbars and 4 metre rail. 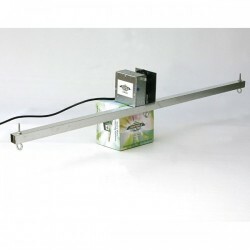 Comes com..
Jupiter 2 Light Mover Motor only with variable delay. 0-60sec variable delay motor. ..